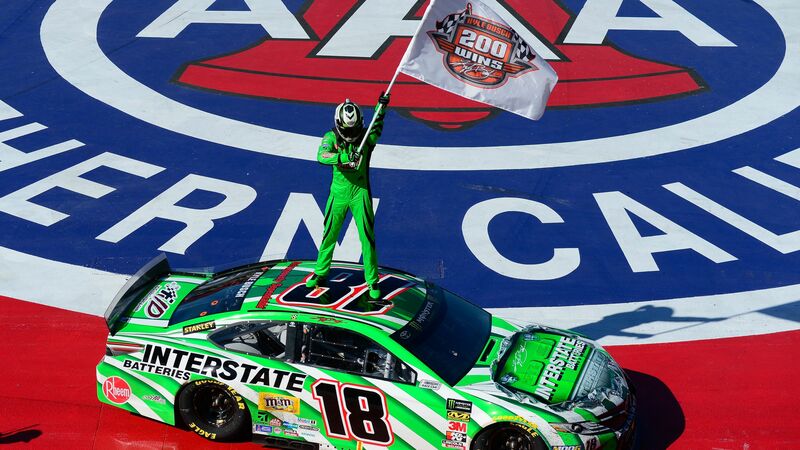 Kyle Busch overcame a speeding penalty and rallied late to earn his 200th career NASCAR win with a victory at Auto Club Speedway in Fontana, California on Sunday. The win ties Busch with Richard Petty for the most career victories on the three major NASCAR series. The location for the historic win was significant for Busch, who also earned his first NASCAR Cup Series win on the same track back in 2005. Busch was in control of the race through the first two stages, but was sent back to 18th place after he was tagged with a pit-road speeding penalty with 73 laps to go. But even that setback didn’t throw much of a wrench in Busch’s plans. Busch quickly made up ground, retaking the lead with 26 laps yet after drafting off of Brad Keselowski and Joey Logano. Busch ended up leading 134 of the 200 laps in the race. It’s all but certain that Busch will claim sole possession of the combined series wins record sooner rather than later. Some NASCAR fans will point out that all of Petty’s wins came on the Cup Series, making it a separate record in its own right. But Busch says that regardless of how you classify his accomplishment, it’s something that he and his team will cherish. While there will be plenty of reflection on Busch’s career, his recent hot streak has also set him up very well for the 2019 NASCAR Cup Series season. Busch’s consecutive wins have made him the first driver to earn two victories this season. He is also the only driver to finish in the top 10 of each of the first five races on the Cup Series, and leads the field with four top-five finishes. Unsurprisingly, that means he leads both the driver standings and the projected playoff standings. That early success has made Busch the man to beat this year, at least in the early going. William Hill lists him as a 9/2 favorite to win the NASCAR Cup Series championship this year, ahead of Kevin Harvick (5/1) and Brad Keselowski (7/1).